Moon maps can be extraordinarily impressive when viewed first hand, but bland and difficult to read when reduced to a text illustration. 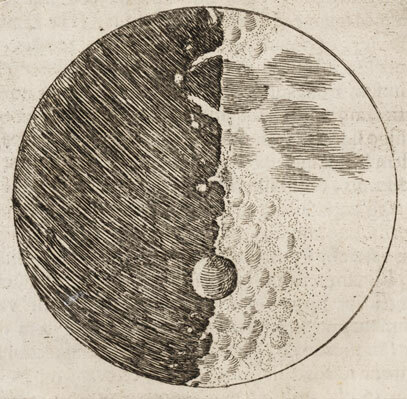 So rather than reproduce the larger exhibition items entirely, we have elected to reproduce details of lunar regions of special interest--either features well-known to the general public, such as the craters Copernicus and Tycho, or features popular with amateur observers, such as the crater Gassendi and the Alpine Valley, or areas that would later be made special by the Apollo missions and their predecessors, such as the Sabine/Ritter region of the Sea of Tranquility, and Mt. Hadley in the Apennines. All illustrations are oriented as in the original publications; this means that north is up in items 1-2, 5-8, 10, 13, 39-42, 44; west is up in item 43; all other illustrations have south at the top. We should also say something about terminology. Lunar nomenclature is established by the International Astronomical Union, and is rigorously latinized. In most cases, this causes little problem for the general public, at least with respect to the craters, named after individuals. But the meaning of Rupes Recta, Vallis Schröteri, and Rima Hyginus is less apparent to the non-specialist, and it is hoped that purists will forgive us for referring to such features as the Straight Wall, Schröter's Valley, and the Hyginus rill. In the case of the large maria, both the Latin term and the English translation are provided.